At this time of year when guitars tend to be bought as presents I get asked if it’s necessary to have it set up, or it’s suggested that as it’s a new guitar it shouldn’t need very much doing. Unless the buyer is extraordinarily fortunate, the answer is always “yes” and a new guitar can need more doing than one that’s been previously set up. Sharp fret ends. This can be due to insufficient attention at the factory or because the wood has dried out causing the fretboard to shrink slightly exposing the ends. A setup on a new guitar always includes a dress of the fret ends. 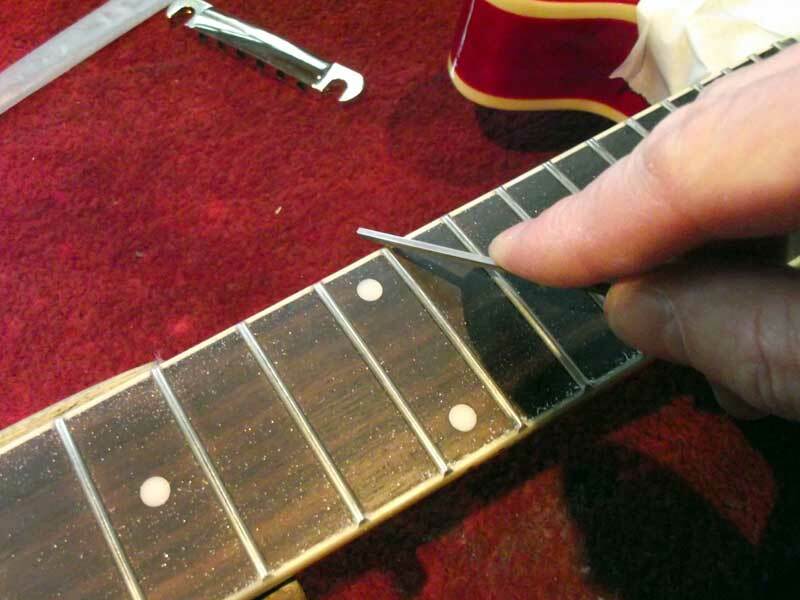 This involves trimming them to the fretboard edge, rounding the ends and polishing to a high shine. Corroded frets. If the guitar has stood for any length of time ten the frets may have tarnished making for a rough, uncomfortable playing surface. A polish will soth that out. Uneven frets. This is less common but still a problem at the cheaper end of the market. Uneven frets will mean that the strings buzz and rattle when played at certain notes. This fix for this is a fret level and re-crown. Not included in a standard setup but doesn’t cost much more and well worth paying for if it’s needed. Nut slots. Almost without exception, new guitars are supplied with the nuts cut too high. Cutting nut slots is a skilled operation and if the tech goes too low, the nut is ruined. For this reason the factory doesn’t do a good job of this. A nut that is cut too high however will cause a couple of problems for the player. Firstly, the strings will be hard to press down on the first few frets. The notes at these frets will probably play sharp too because of the stretching of the strings required to fret them. The guitar’s “action”. The action of the guitar (how well it plays) is down to the neck relief and string height. Both of these are adjustable but rarely optimum on a new guitar. The neck relief is set by the truss rod and needs to be adjusted to suit the gauge of strings fitted. I see very many new guitars with no tension on the truss rod and a large amount of neck relief. I imagine that the truss rod is slackened for shipping from the factory and before delivery the shop just tunes the guitar strings without balancing the truss rod. The string height needs to be low enough that the guitar is easy to play but not so low that the strings buzz or choke when notes are bent. This is controlled by the bridge and/or saddle height and is generally too high on new guitars. Corroded strings. A new set of good quality strings is a must. Intonation. If you want the guitar to play in tune then the intonation must be correctly set. This is often the final job in a setup and depends on the above being right so you can see it’s rarely correct on a new guitar. The intonation is roughed out in the factory but needs to be accurately set using a strobe tuner. So in conclusion, yes a new guitar will benefit from a setup and if you are paying several hundred pounds for an instrument, isn’t it worth paying a bit more and getting the best out of it? 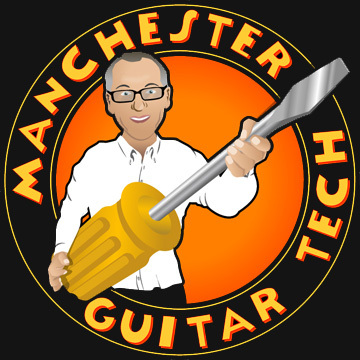 You can see the components of a guitar setup and a guide to prices on this page. Great post and very applicable to me as you’ve just set up my daughters brand new Epiphone ES-339 and it not only sorted out some issues, even out of the box, it looks and sounds fantastic but more importantly plays better than when it was ‘new’ and can only help her playing. One thing, personally, for me is that also part of the process and worth every penny just for this, was that I now know that when she plays it for the first time it will work as it should, as I never would have known about the switch being ‘dirty’ and may have thought it was broken/faulty as a newcomer to electric guitars.